Hi to everyone out in the blogosphere. My apologies, because I haven’t written for some time. Life has just really been so crazy and hectic and I needed to get myself back to where I wanted to be. Needless to say, here I am. Over the past few months I’ve been thinking about life’s difficulties and why some of us seem to go through life pretty easily and why some of us seem to face so many challenges and difficulties. Life doesn’t seem to care what the color of your skin is, whether you’re a male or female, rich or poor, religious or not. Life comes at you and sometimes throws you a nice easy pitches that you can hit and sometimes life throws you a curve ball and you strike out. A little embarrassed, maybe even frustrated, you walk back to the dug out with your head hanging low and try to figure out what just happened and how do I hit that darn curve ball. I know I’m using a baseball metaphor but I think you understand where I’m coming from. We all have those moments where we wonder and say, “WHY ME? !” I have often heard people say, “Why not you?” We all have good days and bad days and if you’re married, you know the famous traditional wedding vows,”…in sickness and in health, in good times and in bad, and in joy as well as in sorrow…” Wouldn’t it be wonderful if we could just have the good and none of the bad? No one would argue with that and divorce rates would probably be non-existent. But would that really make us better people? I would like to believe that it’s our difficulties that mold us. It’s those tough times that really transform us into who we really are and who we’re growing up to be. It’s because of our struggles that we are stronger. Very similar to muscle building we have to tear the muscles in order to build them up and make them stronger (scientifically termed hypertrophy). Please bear with me while I explain. When I was younger, I was very small. I had a big heart and was very tough, but I relatively speaking I was a very skinny and scrawny kid. I wanted so bad to build muscle and to be bigger. So I started to lift weights and thankfully started getting bigger and stronger. So by lifting weights, you are actually causing tiny tears (known as “micro-tears”) in the muscle fibers, which the body then repairs and adapts the muscles to better handle the stimulus that caused the damage. Some key points to remember, which many people do not know, is that if a workout causes too few micro-tears in the fibers, then little muscle growth will occur as a result because the body figures it doesn’t need to grow to deal again with such a minor stimulus. Similarly, if a workout causes too many micro-tears, then the body will fail to fully repair the muscles, and muscle growth will be stunted. If a workout causes optimal micro-tearing but the body isn’t supplied with sufficient nutrition or rest, no appreciable amount of muscle growth will occur. So for optimal muscle growth, you must lift in such a way that causes optimal micro-tearing and then you must feed your body what it needs to grow and give it the proper amount of rest. OK, now I know you’re asking, “Helder, what does this have to do with life and overcoming difficulties?” Well I’m glad you asked! First, we are indeed shaped by those “micro-tears” of life. And likewise, if we have small ones then we don’t really grow or develop fully. Similarly, if we have too many “micro-tears” then we could become seriously hurt or depressed. We need just the right amount of tears and we also need the proper nutrition, i.e. rest, prayers, meditation, coaching and mentoring so that we can fully develop and overcome our difficulties and in the end, be stronger. I came across a quote from Asha Tyson and it really resonated with me about this exact same thing. 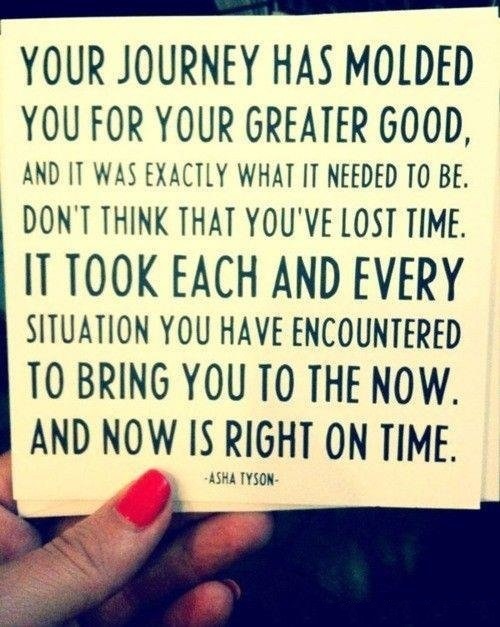 Your journey has molded you for your greater good, and it was exactly what it needed to be. Don’t think you’ve lost time. There is no short-cutting to life. It took each and every situation you have encountered to bring you to the now. And now is right on time. I think that sums up exactly how I feel, I know this has helped me deal with my difficulties and I hope it helps you also. Just remember that in the end, you will be stronger because of those tough times that you made it through. God bless you and your family and make it a great day! Have a great weekend everyone! Leave a reply on "Know that your difficulties helped make you who you are!"